Auto Number is an import feature of Service Contracts. It lays out the rules how the contract number will be generated. Contract numbers can be sequential number or a combination of defined prefix and suffix that can alpha-numeric. Site - The rule can be setup at Site level that impact the entire site. All contracts created under that site even of different business group / Operating Unit / Class will follow as numbering sequence. User Function - You can write you own pl/sql to generate the numbering sequence. Till now what ever I worked I haven't seen using function to generate contract numbers. Business Group - If setup at this level all contract under the business group use the same number sequence unless a specific Class or Category is chosen. If it further dependent on Class / Category then it will unique numbers with the specified combination. Operating Unit - Same goes with Operating Unit. All contract under same Operating Unit will have same numbering sequence unless is further classified based on Class / Category. Class - If set only at Class, all contract created for a particular class have same sequence. Contract Class is like Service Agreement, Project Contract etc. Navigate to Service Contracts Manager -> Setup -> Service Contracts -> Autonumbering. Choose appropriate level or combination from the available options as number generation combination. Most of the organization prefers to have contract generated based on Operating Unit and Contract category to identity the contract OU and category by looking at the number. From - Enter the initial number of the contract. To - You can enter the last number of the contract or leave blank. 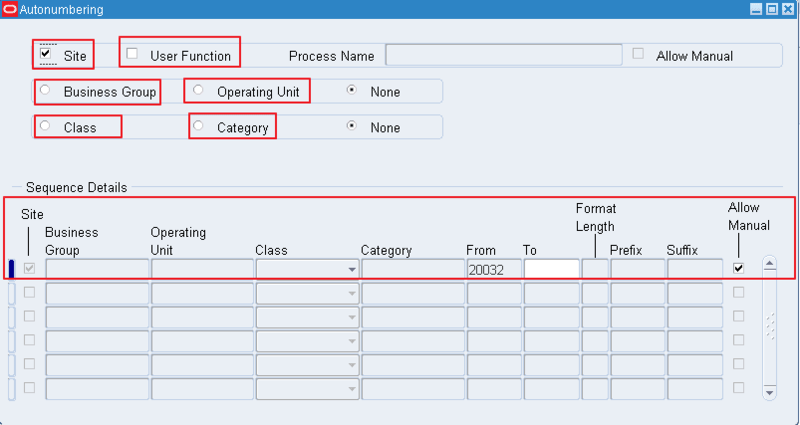 Format Length - You must enter format length if you are not entering To field. Perfix - Choose a prefix. I love to see contract start with OU name to its 'VO-' in my case. Its no mandatory but gives better visibility to the contract. Suffix - Choose a suffix. I opted the choose contract category like 'SC' / 'WR'. 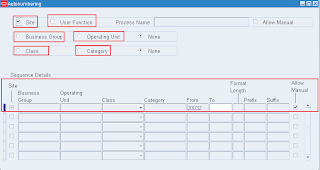 Allow Manual - Choose if you would like to manually enter contract number while you are creating it. 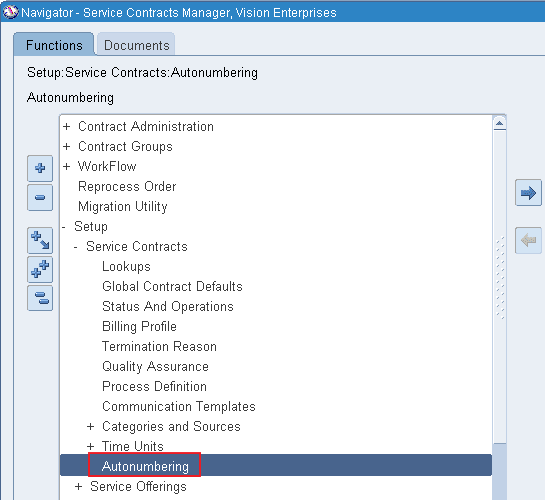 If selected the contract number field will not be read only. If not select then it will be read only field. Note :When a contract is create from concurrent program the number is automatically generated even if the contract numbering is not setup and 'Sequential Numbering' profile option is not set. The concurrent program internally sets the profile option at session level. Its really helps in understanding what all permutation combination of Autonumbering is permissible. So here we go. You are changing the current contract numbering setup. Existing sequence numbering rules will no longer be effective. Do you want to continue? Do you went to delete existing sequence numbering rules? If you click No, then existing sequence numbering rule will be kept in the system. Later if you want to change back to old attribute like Business Group, the old sequence numbering rules show up.